657 W. St. Mary's Rd. Tucson friends are invited to watch and hear me talk about my research for an hour or so. Peer development among Mexican puppeteers is continually cultivating a form of puppetry fed by popular international traditions but with distinctly Mexican roots. This research taps into virtual and face-to-face communication within Mexico's puppetry community to provide dynamic glimpses of this culture and to explore how new tech platforms help it grow. At Teatro Isabela Corona in Mexico City, sneering young theater performers bathed in blue light hold the various parts of their Pinocchio character together during his scenes but then head in separate directions between them. This actor holds the wooden stick that becomes Pinocchio's nose, that one holds the cork-like oval that becomes his head, a third and fourth carry the bike frame tubes that become his legs, and so on. The "puppet" only exists when the actors cooperate him into existence. The group is FiguraT, clearly named to suggest the term figura teatro, or "theater of the figure." Terms are important for my work, because I will be classifying what people are doing. So I've been trying to pin down what made this performance figura teatro. FiguraT's Pinoxcho reminded me of a performance in which the physical comedian Wolfe Bowart of Spoontree Productions combined objects including a plastic cooked turkey to make distinct momentary characters. I would not call Bowart's performance "theater of the figure," however, because the turkey-headed being Bowart created in that moment was not an important dramatic character. 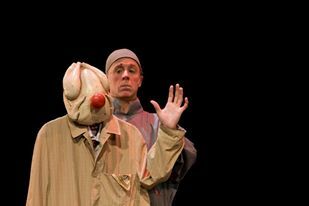 I would call Bowart's style in that performance "object theater" because the turkey is not really elevated from its status as object; in fact, its objecthood adds to the humor of the show. Still, figura teatro can mean the opposite of what it first seems to suggest. That is, the figure does not always exist in "theater of the figure." The creation of the figure is part of the performance, as is the figure's dismantling. Focusing on its birth and demise makes the figure at least as focal a point in the performance as the plot the figure is engaged in. To me the most memorable element in Figurat's show was an enormous cloth. Actors used their hands to gather the cloth at the neck and limb joints to create Geppetto, and it remained Geppetto when they came apart and stretched it out...but an expansive Geppetto, radiating his fatherly love and concern across the stage. Gilberto Palma and the other players of Happy Show in Mérida, Yucatan use puppets, costumes, and performance to preserve and spread traditional Yucatecan culture. At the show I saw in the tiled courtyard of the Holiday Inn on July 6th, Palma wore the traje típico for men in the Yucatan – a white cotton suit and hat that clearly offered more comfort in the sticky heat than the modern jeans and t-shirts worn by families watching the show. The show was free thanks to funding not only by the hotel but by state support of Happy Show’s cultural transmission mission, borne out in the mobile show I watched through a story about the Rey of Uxmal and songs by puppets in traditional Yucatecan dress. Balancing the show's educational message was its circus theme. I like to think of the puppet dog and seal from that circus as fabric fusions of the historic partnership in Mexico between itinerant puppetry and circuses. In the heyday of itinerant puppetry in Mexico, people learned what it meant to be Mexican through shows like these. Now Happy Show is using their brand of teatro infantil to teach what it means to be Yucatecan. Palma and his group come across as solidly professional. Whether the children they entertain number 5 or 500, those children will see a show that is well-rehearsed and well-amplified. The young adults who perform with Palma in Happy Show are his apprentices, and they may preserve Yucatecan culture in their own troupes as they grow older. Palma himself learned from a pillar of puppet theatre arts in the Yucatan: Wilberth Herrera. In my study of communication and peer development among puppeteers, Herrera has emerged as the father of the modern puppetry tradition in the Yucatan. Herrera passed away in 2011, but in the video below his fancy footwork lives on. On July 4th, while my compatriots ogled great rains of fireworks, I stared at a single flashing light. Fireworks to a single flashing light; a reduction of many to few and much to little. To pull the complexity of human feeling into an object is an intense economization. When that feeling is humorous, the pressure that rises from its reduction within a puppet can make the human viewer erupt with laughter. But with the Kaput Proyect’s The Falling Love there is no eruption of that tension. The show's wooden puppets, though breathtaking, are carved so sparely they retain the impassivity of trees. Their story about love and despair is expressed through the sounds of one musician, Monica Lopez Lau, and the movements of their puppeteer, Edwin Salas, who also uses Noh and other dance techniques to keep the tension high and precisely placed. At least this is what I have gathered. I haven’t seen this show live yet, but I have watched pieces of it on YouTube and Facebook. Through these platforms I also met Salas, and on July 4th I had the pleasure of sitting in on his interview with Mexico City's Radio Mente Abierta and that single flashing light. The interview connected Salas with the hip intellectuals who listen to Radio Mente Abierta, and doubtless with other artists as well. Salas is ceaseless collaborator, creating a stream of works with other artists including dancers, musicians, and puppeteers. Many of these relationships begin online, where again, economy of expression is at work. A short video clip or radio interview serves as a digital blip of an introduction, igniting an intensely human process of collaborative decisionmaking. Every piece of information one of these artists offers the other online is shared but also stored in a dynamic collection across platforms, format, and often, language. I look forward to seeing the Kaput Project’s The Falling Love at the Palacio de Bellas Artes on July 14th. I also look forward to listening to this radio interview again once I am fluent in Spanish. English today is burdened with too many words, even as online communication challenges us to use fewer. During the radio interview I mostly listened, but when I spoke I tried to remember to economize words, because Spanish is best spoken in few words. Mejor hablar con pocas palabras. 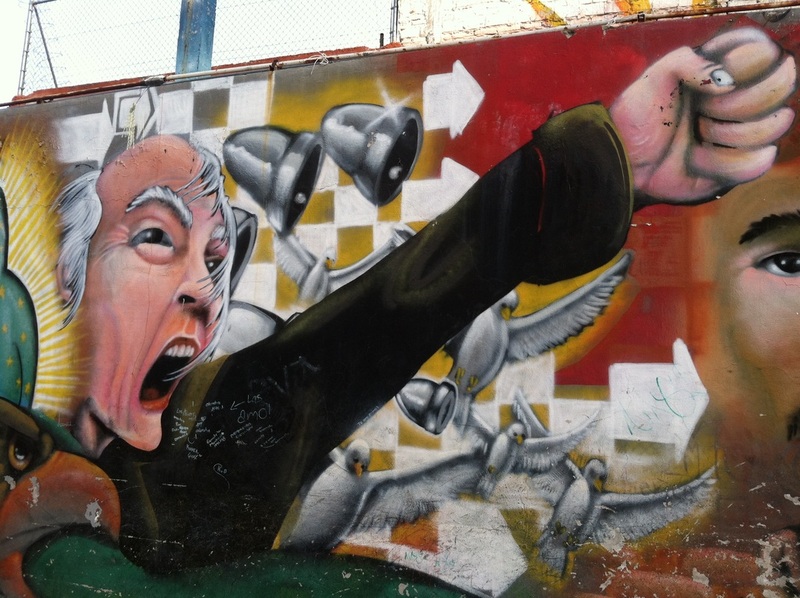 A mural in Irapuato, where I saw the capacity for protest via puppetry that played with the most traditional of themes. 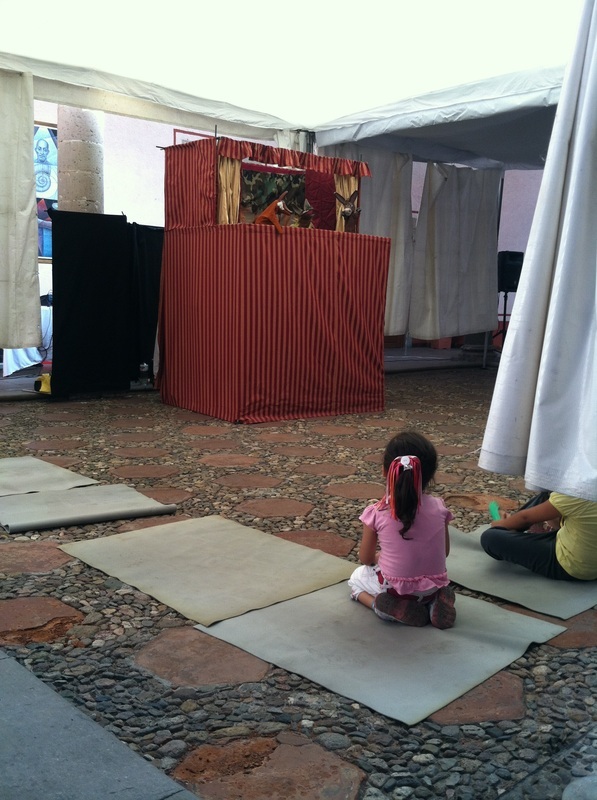 I attended a puppetry festival in Irapuato, a town in the state of Guanajuato, northwest of Mexico City. Many of the performers had participated in puppet theatre workshops for librarians, taught by puppeteers. Because this research focuses on all the communication used in all levels of involvement in puppetry from beginner to professional, this small festival was an ideal research site. Puppet constructed in workshops were on display. The festival's locales were in several spots across the city, which meant either navigating our way around by local transport or watching the shows in only on location. My traveling partner Caro and I ultimately decided to focus on the shows in the cultural center across from the church and withing walking distance of our hotel. Cultural centers hosting shows and workshops in the arts seem to be present in even small towns in Mexico. The free shows here entertained families who sat on mats on the floor or in folding chairs in center's in the open air foyer. I scribbled notes during the shows. One note I wrote: Shows mostly focus on traditional themes and don't question. But I was surprised as the performances went on, that the questions were just presented in ways I wasn't expecting. The show "Maria Angula", for example, begins with the wedding of "the most beautiful woman in Irapuato, Maria Angula!" She marries a man, and then sets out to make him happy at the dinner table he never seems to leave. He demands roast chicken, and she asks the audience in quivering voice, "Does anyone know how to make roast chicken?" Then she sneaks out to her friend's house - which has been ingeniously constructed as a flip-up flap beneath the table - and her friend gives her the recipe. Play this out three times* and you have a very traditional show that families feel involved in for its familiarity. I scribbled notes about lack of protest because the demands of the husband in the show are never openly protested. Maria never shouts, "Make your own pozole, you brute! I've cooked enough for you today!" But it is after the traditional three repetitions of his demands that things get interesting. She grows frantic as he demands dishes that are more and more difficult to make. His fourth or fifth order is for tripa, but she can't find any tripe. Instead of telling him no at last, she goes to the graveyard, digs up the corpse of a man, pries open his coffin, and cuts out his intestines. The intestines trail behind her as she heads back to a kitchen, cooks it up, and feeds it to her husband. Later, the wild-haired, hollow-eyed corpse with his sliced intestine trailing hunts her down in her bed and stiffly drags her back to the cemetery and into his coffin. When she emerges she is also wild-haired and hollow-eyed, and at the end she dances to Michael Jackson's Thriller accompanied by skeletons of other muertos. Traditional to the point of absurdity and very aware of it. This is one face of Mexico. *Humorous puppet shows often repeat a theme three times. Repetition makes the theme easier to follow no matter who is in the audience, i.e. children at a library or drunkards at a raucous festival. Puppetry is a fascinating art form from an Information perspective because it is defined by balance in the technology it uses. The term technology today has come to mean digital tools - the more, the better. But when I speak of the balance in technology inherent within puppetry, I am using the older meaning of technology: Using devices to more effectively accomplish our goals. 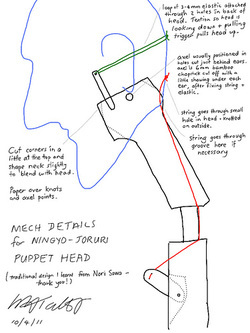 A puppet itself is technology used toward the goal of creative expression, but a puppet's movements must convey to the audience an intimate connection with the movement of the puppeteer(s). Overdo the technology of Mr. Punch, or El Negrito, or Hanuman, and you end up not with a puppet but with an automaton. In the US, birthplace of so many digital innovations, we rarely imagine a ceiling for our technological inundation. In my studies of of Information and Library Science, I have begun to explore how people who know how to balance technology approach social networking. 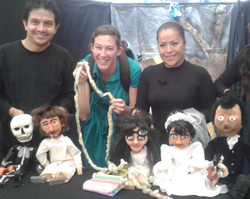 Although puppetry exists everywhere, I chose the puppetry community in Mexico as the focus of this research because in my experience digital technology is approached very practically here in Mexico. Tech skills are not perceived as hallmarks of superiority; one simply learns them to advance human objectives. Image by Hil via Flickr. Knowledge about puppetry techniques, source and construction materials, performance venues, and marketing are just a few of the types of information that are shared online in this community. But on a deeper level, the puppetry community in Mexico is interesting from an Information perspective is because it is alive. 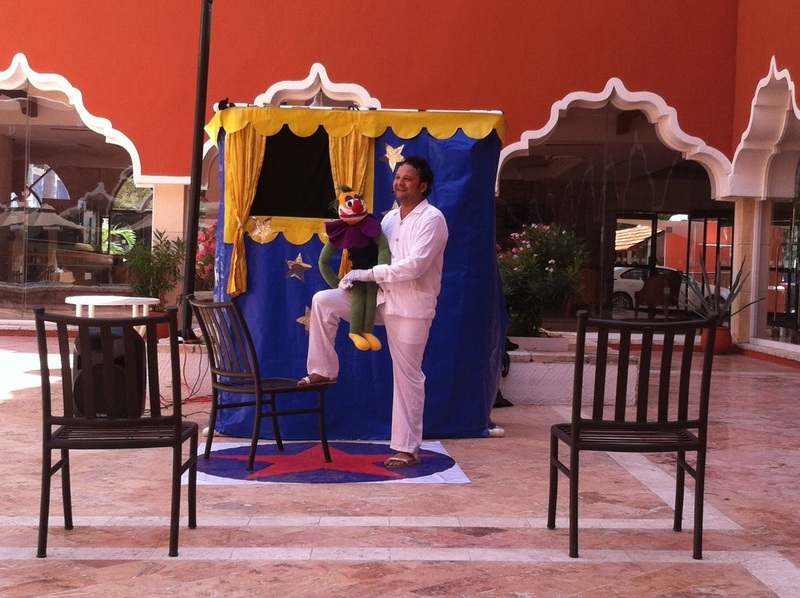 Puppetry in Mexico was once tremendously popular, but as in so many other nations, today's puppeteers here do not typically earn much money from their art. Still, puppeteers persevere, in large part because periodic UNIMA events and puppetry festivals bring puppeteers together, and online networking reinforces that togetherness. Just as hybrid education has emerged as the most successful educational model, so is hybrid networking now emerging as the most successful social information model, because periodic face to face engagement inspires perseverance. Puppetry is a a labor of love, and love cannot live long online. Mutual support that Mexican puppeteers provide one another keeps them performing, and reinforces their belief in their art regardless of is obscurity. I have already learned about some crucial factors in this community's support system. No single organization actively connects puppeteers across this nation. The puppetry support organization UNIMA does connect them in name, but UNIMA exists here in local delegations, with relatively little activity at the national level. When I was writing proposals for this research, my problem statement centered on the fact that this community is not centralized, and should be. What I've seen already, however, is that this is not a problem. Indeed, this network's decentralized layout is essential to its success. This decentralized network is not a system, but an ecology. Systems are structurally complete when they begin, and any addition of new hubs disrupts the whole system. Ecologies, on the other hand, welcome new life and use it it to balance the life that was already within. (For more about Information Ecologies, read Davenport & Prusak (Oxford UP 1997) and Nardi and O'day (MIT Press 1999). Ecologies accommodate expiration as well: Whereas the breakdown of a cog within a system causes havoc, in an ecology it can be absorbed the jungle-like whole, or make room for new life in its place. None of the people or organizations supporting Mexican puppetry is paid much to do what he or she does. But peer development nurtures newer puppeteers until some are ready to become hubs themselves, and nurtures hubs so that rather than burning out, they can take a back seat and ride for a while on the energy of others. It is my third day in Mexico City and I have been unexpectedly busy with the online portion of my research, and with classes to improve my already spectacular Spanish. (Bromeando ;-) What I haven't done is meet a single living puppeteer (or puppet). I have exchanged emails and gotten survey responses with many puppeteers here, but the first shows on my schedule don't happen until this weekend. I did speak briefly with a librarian who has a permanent puppet stage beside her desk, but I don't think it's hers. She only spoke to me to tell me not to take photos. I have spoken about puppetry to a few locals. 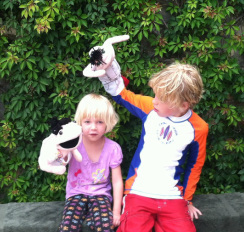 The dueña where I am staying lamented that children today have little interest in puppetry. And then there was an exchange with my Spanish professor, Armando. When I was introducing myself, I explained a bit about my research. "You are studying puppets?" He said, his face pulsing with incredulity. "Why?" He even reiterated in English. I explained that collaboration among puppeteers is very strong, and therefore a good model for information science, and so on. "I have always hated puppets," he said. "Whenever my mother wanted to take me, I screamed, No!" I thought I might introduce him to some lesser-known forms of object performance which fall under the umbrella of puppetry, so I pulled out the book Títeres y Titiriteros: El Lenguaje de los Títeres by Pilar Amorós y Paco Paricio. He flipped through photos of hopelessly congenial muppets (bocones) and marionettes, then chose a page with five images of pole puppetes. "Why are they scary?" He asked, thrusting the book at the class. "Why do they want to scare everybody?" I closed my book and smiled, and as we moved on to discuss the future tense I thought to myself, un día el abrirá su corazón a los títeres. Later I learned what he does like: Kiss. That's right, the band. He doesn't think Kiss is scary. So Armando, este video es para tí. Oral histories are recordings of firsthand knowledge about the past. In this research, there is much puppeteers can reveal about how community interaction and social networks have helped them create and present works of art. What are my objectives when I make puppet theater, and in what ways do others help me achieve these objectives? We made three videos, each of them 5 minutes or under, using my iPhone. The whole process took about an hour and I enjoyed every moment of it. If you are a puppeteer in Mexico and you would like to participate in an Oral History as part of this research, first please complete the survey. Indicate on the last question of the survey that you would like to create an Oral History. Then, I will do my best to arrange to record your Oral History in person if my research schedule permits. If I will not be able to meet you in person, we may be able to arrange the Oral History online. You will help create your guiding question, and you can tell your story in whatever way you like. 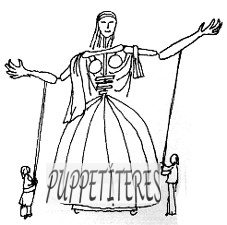 Puppeteers are creative collaborators and natural storytellers. Why not records puppeteers' stories to teach the world about creating together? For more information on the schedule, email didaly@email.arizona.edu. I will design a virtual community space for Mexican puppetry, using lessons learned from Mexican puppeteers about collaboration. The virtual space will share Mexican puppetry with other puppeteers, researchers, and the world. Se puede traducir este página a español abajo.